Gopikrishan was born in Trivandrum in 1965. He did his BGA from College of Art, Trivandrum & MFA from College of Art, New Delhi. 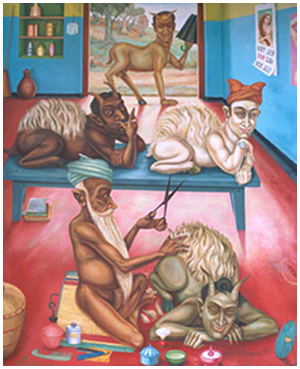 He has had a lot of solo shows the first one in 1989 in College of fine arts gallery, Trivandrum. The others include ‘Beyond the known’, `Gates to Decivilization’, ‘Secret Energy`, ‘Turtle Hatchery’, ‘Swan and other paintings’. He has been participating ina lo of group shows abroad which include, Group Show, Schoo’s Gallery, Amsterdam, Bose Pacia Modern prize for Contemporary Art Show, New York, Exhibition of Indian contemporary Art, curated by Justin Marx, Gallery Lombadi, Texas, U.S.A, ‘Double Enderos’, Traveling Exhibition Curated by Bose Krishnamacharoi, Group Show, ‘Exile & Longing’, Lakeeren Contemporary Art Gallery, Mumbai. This talented artist has been awarded for his excellence in art. 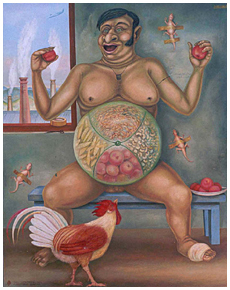 In 2002 he was awarded the, State Award for painting, Kerala Lalithakala Akademi, in 2001 Runner up, Bose Pacia Modern prize for Contemporary Art, New York, in 2002 Award for drawing, All India Fine Arts Society, New Delhi. Apart from this he has been actively participating in artist’s camps.